Ever wonder about the blockchain uses or blockchain technology applications? Don’t worry! We are going to discuss the blockchain technology applications in the real world. At the end of the article, you will come to know about the potential of blockchain technology and how the blockchain technology can change the world. The traditional centralized system is no more secure as we are witnessing some flaws in banking, e-commerce and other online industries. The blockchain technology is aiming to provide the user solution to such security issues. The blockchain technology will be widely used in near future. If you have an online business, you must have a proper plan to shift it over the blockchain. The blockchain is the emerging technology of the current decade. The companies around the world started working on blockchain adoption. 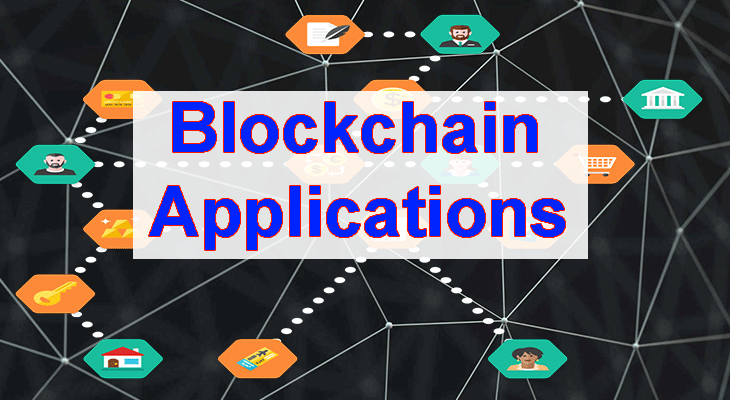 There are several blockchain technology applications available in the market and the number of blockchain applications is increasing over time. There are many new companies entering the market using blockchain technology to secure their system. The blockchain will provide the extra layer of security to the businesses over the internet. That’s the reason the world is adopting this new and secure technology rapidly. This technology can be implemented in any field of life as the internet is working. We can secure our data on cloud platforms using blockchain technology. We can send and receive data over the internet using blockchain-based platforms. The blockchain technology is a complex and new technology. That’s the reason, it will take some time for the businesses around the world to completely adopt the blockchain technology. We need more expert and more research on blockchain technology. One of the main reasons why the world will adopt blockchain technology is the low cost and more security. As we know the cyber security is the threat to online businesses. The blockchain is providing a secure way of managing data over the internet. For the security concern, we can say the businesses will adopt the blockchain technology. We will witness an increase in blockchain technology applications in near future. Maybe the whole world will adopt the blockchain technology. Maybe Facebook will launch the blockchain version of their application. But we have to wait till such a wonder happened. Recently, I was studying the Saprkster ICO and it just surprises me. The idea behind the project is amazing. The Spakrster is introducing the blockchain version of WordPress, blogger, Weebly etc. The users will be able to build their website with simple drag and drop using Sparkster platform. Sparkster is the one example of blockchain technology applications in the real world. There are numerous blockchain technology applications available. We know Spakrster is going to compete for the website building platform available on the centralized internet. Similarly, other decentralized platforms of the existing centralized platforms will make their way to the market in near future. This article will be discussing prominent blockchain applications examples. One of the best and most prominent blockchain applications is the decentralized internet. The blockchain technology aims to provide the world with decentralized internet, where no central entity will hold the data of the users. The data will be stored on the distributed ledger. These ledgers will be available on different nodes across the network. We can say the will be more secure. The data will be available on different computers all around the world. The security is the key feature of the decentralized internet. As the data will be available on multiple computers in the different parts of the world. Thus it will be more secure. The decentralized internet also uses the technology of cryptography to encrypt the data. The encrypted data is secure and the hacker will not access it easily. Furthermore, in near future, we will witness numerous decentralized application. There are already some decentralized applications available on the internet. The blogging platform Steemit is one of the blockchain application. You can also build your own decentralized application using Ethereum platform. Ethereum is an open source platform and business can use the Ethereum platform to launch the dApps. Different companies are entering the market with the more powerful blockchain as compare Ethereum platform. Zilliqa, Stratis, Waves, EOS, Ethereum Classic ETC etc are the main competitors of Ethereum. In addition to Ethereum, there are many other platforms are making their way to the market to help the businesses develop their decentralized application(dApp). We can predict the bright future of the blockchain application by examining the growing market. Blockstack is the leading company trying to provide the world with decentralized internet. One of my favorite blockchain technology applications is the security and privacy of the data. The data store on blockchain is distributed over the entire network and no central authority can hold the data. The data is in encrypted form. Thus no one can access the data. The only user can access the data with his private key. The traditional internet is not providing the users with security and privacy but the decentralized internet is the is promising and transparent. Recently the news was viral over the internet related to data leak by Facebook. The twitter with trending with DelateFacebook hashtag. The reason was the unethical behavior of Facebook. But the Facebook refuse the allegation impose by the community. But somehow we can deduce that the data available on a central server is not secure. The company has the hold over the data and even company can leak the personal data of the users. Blockchain will provide the world with a decentralized internet. The data will be more secure, immutable and transparent. Cryptky and Sia are the leading projects in blockchain data security. Another famous blockchain application is the use of smart contracts. Have you ever did a contract with some company? Or maybe you notice some contracts between different companies? When you purchase a house or car, you make a contract with the company form which you are purchasing the car or house. The similar contract can b apply to the online world and it is known as smart contacts. The smart contract is a simple computer program that helps in making the online agreement between individual and companies. The idea of a smart contract was initiated by Nick Szabo in 1996. You can simply develop the smart contract on Etheremu [platform by using the programming language solidity. The smart contract on Ethereum platform is decentralized. The example of the vending machine is perfect for smart contract understanding. The customer receives the drinks from the vending machine by entering the coin. There is no third party involved in the process. Similarly, there is no third party involved in smart contracts. Smart contracts are decentralized and distributed ledger, that’s the reason it is almost impossible to hack the smart contracts. The users can simply make virtual contracts using smart contract technology. Ethereum is the leading company working on smarting contract technology. Internet of Things (IoT) is connecting the physical with the internet. The future of IoT is really bright and blockchain technology is mixing with IoT. The blockchain technology has a tremendous role in connecting the physical products with the internet. The different task like paying the bill on a car parking will be done over the internet. In 2015, IBM and Samsung demonstrated a blockchain application called ADEPT (Autonomous Decentralized Peer-to-Peer Telemetry), which is designed to spread the Internet of Things and allow devices to communicate directly without the need for a manufacturer’s hub to block and attempt Lock users into specific ecosystems. The blockchain technology and IoT are joining together to automize the physical products. The most prominent project in blockchain IoT space is Iota and IoTEX. IoTex is a cryptocurrency that will help the people in paying bills online using decentralized technology. This little scenario will help you understand how the IoT is combining with the blockchain to revolutionize the world of physical products. You are a car owner and you are a plan to have a dinner at the famous restaurant in the town. You have the IoTex cryptocurrency in your pocket. Now, at the car parking stand, you park the car and the automatic system at the parking stand detect your car. The system will detect the fixed amount as a car parking fee from your wallet. The system will totally decentralized and hence we can say it will transparent. You will have your dinner and get back to your car. Don’t need to pay physically to the parking boy. This is how blockchain is combining with IoT to make our lives easier. This is just a single example of blockchain applications in IoT. There will be more coming in near future. You will be purchasing the products from the robot and will be paying in cryptocurrency. While discussing the “blockchain applications” we can never forget the decentralized market. The decentralized market is revolutionized the online merchants and trading platform using blockchain technology. In a decentralized market, the users can trade without the influence of the third party. The user will interact with one another with the help of peer to peer network. As the network is distributed, we can say, it is secure and can’t be hacked easily. There are many other advantages of the decentralized market. It provides the users with more efficiency and more security. Openbazaar is an online decentralized marketplace which allows users to sell products online. There is no third party influencing the market. The data is stored on a peer to peer network of powerful computers. The consumers can purchase different products using mainstream cryptocurrency like Ethereum, litecoin, and bitcoin. Binance exchange is one of the decentralized markets that ‘s based on blockchain technology. There are numerous platforms like Coinbase, Bitterx, IDEx that involve in cryptocurrency trading. While discussing the blockchain technology applications we should not ignore the blockchain based care leasing platforms. Getting a car on rent can end up being a long process, with multiple parties involved, and everyone needs to verify the information before the car gets off the bus. DocuSign, which focuses on secure digital files, works with credit card giant Visa to apply blockchain technology to smart contracts, promising to simplify the “click, sign and drive” approach to securely renting vehicles. Now, as long as they can lower the price of these mats. It really hurts when you click a picture of nature and edit it to make it more beautiful. After posting the picture on your Instagram, you notice someone is posting a similar picture on Instagram with a changed logo over it. You are helpless, someone just steals your picture and didn’t even give a credit back to you. With this in mind, at the recent CES show in Las Vegas, Kodak announced its new digital currency, KODAKCoin, which is supported by the blockchain ledger and image rights platform KODAKOne. Kodak hopes that the new virtual currency will help protect digital image rights for photographers, allowing them to securely register their work. Another ‘blockchain application’ is decentralized cloud storage platforms. We all know about Google Drive, a cloud storage service worldwide. The Google drive store the data of the users around the world. But there is a risk of security. We know the data is stored in the database of Google. There is always a risk of being hacked. The decentralized cloud storage service will help the users in securing the data over the distributed ledger. The data will be stored on the different computer around the world. Thus we can say, our data will be more secure and easily accessible. If a hacker wants to hack the data over the decentralized cloud platform, he has to hack all the systems over the world. Another advantage of decentralized cloud platform is, it is low cost. The users have to pay the fee while storing the data on Google Drive and other cloud storage platforms. But the decentralized cloud platform will be very low cost. Thus blockchain application will be playing their role in storing the data over the cloud. Storj is a decentralized cloud storage available over the internet. The most trending application of blockchain is the solution to the cross-border payment issue. In the traditional banking system, we have to depend on third-party banks but blockchain is eliminating the third party. The users will be able to send and receive payments over a peer to peer network. The encrypted data will add an extra layer of security to transactions. The transaction on the decentralized network is low cost and more secure as compared to the traditional banking system. Recently, the hacker steals the credit card details of Pakistani banks. Later on, the hacker steals the information from the bank using the credit card details. We can say the traditional banking system is no more secure as the data is stored on a central server of the bank. In the case of blockchain technology, the data will be stored on the distributed ledger and it is almost impossible to hack the decentralized system. Bitcoin is the most prominent example of payment solution over blockchain. There is some issue with the late transaction but some new projects are entering the market with more transaction speed and scalability. The next “blockchain technology application” we are going to discuss is the decentralized social networking platform. The social networks are playing an important role in engaging people around the world. We have the example of Facebook. Facebook is connecting the people all around the world. The world has become a global village. The internet makes the way we interact with friends and family that are away from us. The centralized social networks like Twitter, Facebook, Instagram, Linkedin etc are holding the data of users all around the world. Facebook also started working to develop the most secure blockchain. Facebook is keeping its closure, but the resignation of one of its executives from the board of Coinbase has sparked speculation that the social media giant is planning its own blockchain. They can trace user’s activity over the internet. Facebook trace every activity a user perform over the internet. The decentralized social network platforms can provide the user with the security and privacy of their data. The user will not be dependent on the central authority using the decentralized social network. In a decentralized world, even the governments can’t access the data of the users. The data is stored on distributed ledger using cryptography and hashing techniques. The date of the user will be available on different computers all around the world. If someone wants to access the data he has to hack all the computers available in different parts of the world. That’s the reason we can say the decentralized social networks are the best blockchain applications that will make this internet more secure. Some famous blockchain social networks are Minds, Memo, Sola, and Steemit. Steemit a decentralized blockchain application where you can post the articles and earn some money. The medical field is one of the sensitive fields when we talk about the data store in the hospital management system. Every hospital management system store the personal data of their patients. It is necessary to store the data of the patient securely. At the same time, the centralized system involves risk. Recently a ransomware attack on hospital lock the systems in the hospital. Such hacking attempt can cause the human life in danger. We need a more secure and transparent system for hospitals. One of the blockchain technology application is the secure storage of data at of hospitals. Applying blockchain technology to healthcare records is expected to improve data security, provide better access to healthcare professionals and patients, and increase the transparency of healthcare transactions. Gem has established a partnership with medical technology company Philips in this area. Another leading company in this sector is MedRec. Encrypted messaging apps are another example of blockchain technology applications. Different companies around the world are working to lunch the encrypted messaging apps based on blockchain technology. Even the instant messaging giant Telegram is planning to move their platform to blockchain technology. The company has already started their ICO. There many other platforms available that are providing the facility of instant messaging using the decentralized technology. These platforms aim to provide the users with security and ownership of their data. Like in decentralized social networks, the data will be stored on distributed ledger all around the network. Thus we can say the data will be more secure. The most prominent blockchain based messaging applications are Dust, Cryptviser, Echo, e-Chat, Telegram, Status, Vibeo, Kakao etc. Proof of ownership is a method that use blockchain technology to track the data of certain owner over the time. This helps the owner of the data to reserve and control the data. Sometimes, you click an awesome picture of nature and after editing it you upload it on Instagram. After some days you notice the same picture on other platforms with a modified logo. It really hurts when someone steals your art. The blockchain is aiming to provide the solution to this problem. Your videos and other data will be fully copyrighted and no one else will be able to use it without permission. Blockchain technology store the data on a distributed network in encrypted form. Only the people with the private key of the data can prove they are the owner. The current voting system has many issues. There is a lack of transparency. The blockchain based online voting system is also one of the ‘blockchain technology applications’. This voting system will help the voter in casting their vote at home. The voter doesn’t need to physically go to the polling booth. This will save time and cost for users as well as governments. There will not be any chance of a rigged election as we know blockchain is based on the cryptographic and hashing algorithm. The data of voter can never be changed once after voting. No one will be able to cast vote again as we notice in the traditional voting system. The world is adopting the blockchain technology so rapidly. Even an online blockchain application regarding voting is already available. Follow my vote is an online application. The application aims to provide an efficient voting platform to the world. Blockchain technology will provide transparency to the music industry. There will be no more stolen music. The right for the music will be reserved by the original music company. Key issues in the music industry include ownership, royalty distribution, and transparency. The digital music industry focuses on the monetization of products, and ownership is often overlooked. Blockchain and smart contract technology can solve this problem by creating a comprehensive and accurate music rights decentralized database. At the same time, the ledger provides a transparent transfer of artist royalties and real-time releases for all those participating in the label. Players will pay in digital currency according to the terms of the contract. VOISE is an anonymous, decentralized platform based on blockchain with personalized tokens based on the Ethereum smart contract ecosystem. VOISE is an innovative cryptocurrency solution for the music industry that allows artists to monetize their work in a collaborative P2P market. They can set prices for their work, provide free sample tracks, and seek support from music lovers and users on the platform. The stock exchange is the backbone of the modern world economy. It is playing a major role in the progress of countries. One of the key blockchain technology application is the decentralized stock exchanges. The decentralize stock exchange will utilize the blockchain technology to provide the world with more security and transparency. The world is adopting the blockchain technology so rapidly and it is the need of the hour to move the stock exchanges to the blockchain. And the companies are already trying to provide the world with blockchain based secure and transparent stock exchange. The Blockchain Could Change the Backbone of the Stock Market. Over the decentralized stock exchange, the companies will interact without the interference of the third party. There will be no risk of data leakage as the data will be stored on peer to peer network. In 2015, Nasdaq selected blockchain start-up chain stores to pilot private company stock trading. These companies do not trade on exchanges and require a lot of paperwork. In October 2015, NASDAQ launched Linq, a solution that allows private companies to use digital blockchain technology to represent their equity. The blockchain technology applications also have real estate on the list. As we know blockchain technology is transparent and secure. Blockchain technology has made great strides in real estate, both in terms of payment solutions and in achieving greater efficiency and transparency for the exchange itself. Many rely on blockchain technology to transform real estate business one day by shifting all aspects of the transaction to a digital platform, making it faster, cheaper, and more resistant to fraud. The blockchain is known for tracking who owns a purely digital currency like Bitcoin, but government agencies and for-profit companies are increasingly exploring how to use digital ledgers to track the ownership of very tangible things. Founded in 2013 by Ragnar Lifthasir, the International Blockchain Real Estate Association (IBREA) is a membership-focused education and trade organization dedicated to implementing blockchains in the real estate sector. IBREA has more than 5,000 verified individual members and multiple industry members worldwide. Using blockchain technology, NAPR can provide its citizens with digital certificates of their assets and support them through cryptographic evidence posted to the Bitcoin blockchain. According to UNICEF, in 2013. A third of children under the age of five were not issued with a birth certificate. The wedding, birth, and death certificates are necessary as these documents are showing you’re born, married, died. You can get the rights of a citizen with the help of these documents. That’s why we need a secure, reliable, and efficient system to design our personal documents over the internet. The blockchain is going to help the community in designing such documents. Blockchain-based birth certificates can lay the foundation for a more free society. Indian State Government is planning to issue birth certificates on a blockchain. The Illinois government has begun testing blockchain-based birth certificate digitization systems. They are working on a pilot project with Blockchain identity startup Evernym. The blockchain technology applications and uses are numerous and we can utilize the blockchain technology in any field of life. But it will take some time to completely adopt the blockchain technology. We have a range of identification: our driver’s license, passport, computer password, ID card, key, social security ID and many more. Blockchain will be helping us in designing such documents over the internet in near future. There are many other blockchain applications apart above mentioned applications. The blockchain can be used everywhere. The blockchain technology is going to take over the world in near future. The businesses are adopting the blockchain technology. The e-commerce giant Ali Express is working on their own blockchain. Similarly, the finance companies around the world are adopting the blockchain technology. We can’t deny the importance of blockchain technology. Bitcoin is just on example of blockchain technology applications. There are many other applications of blockchain technology and the future witnessed the more scalable projects. People often thought bitcoin as the only application of blockchain. This is totally a wrong perception. Bitcoin is to blockchain as the Facebook to the internet. It is just the start of revolutionary blockchain technology. The good is yet to come.